Want more bookings? Of course you do! Our goal is to get your trailer booked as many nights possible and put more money back in your pocket, where it belongs. Most of the highest earning trailer owners on Wheel Estate share their listings to their social channels as well as facebook groups. We do all the heavy lifting and create an automatic post for you.....all you need to do is hit the send button and then your listing is visible for all your friends and followers to see on social networks. One of the most successful hacks trailer owners told us they use is sharing their URL in Facebook groups, such as Buy & Sell, Garage Sales, City & Community Groups. Once in these groups, owners simply copy and paste the URL from their trailer listing page. To do this, just highlight your custom URL and share away. Don't be surprised if you land a couple bookings right off the bat. 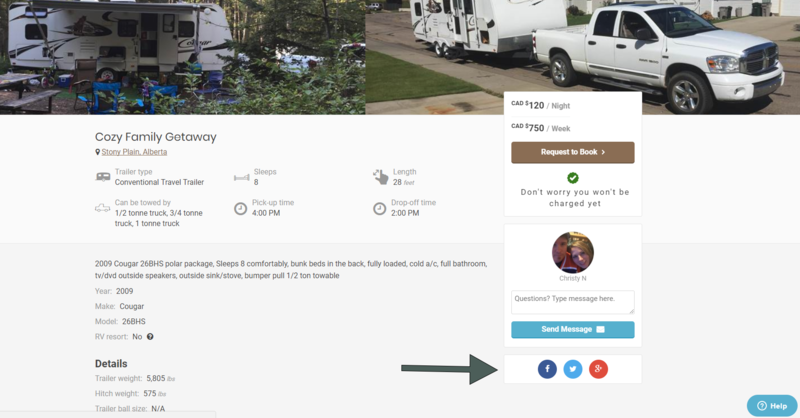 Here is some step by step instructions on how easy it is to post from your trailer listing to your social network. Go to your trailer listing on the website. It will look similar to this page below. Click on the social share icon you wish to promote your listing on. Another way to easy filter where you want to share your post such as groups is illustrated below. After you select the social platform you want to share your listing on, in this case Facebook, this auto generated post will appear. Enter some witty comment on WHY your friends should help share your listing with their friends, or WHY they deserve a vacation and need to rent it. Hit "post to Facebook" and that is it. Verified trailers listed on Wheel Estate are protected every trip with our $1,000,000 insurance policy. Learn more. If you need help with sharing your listing we are one click away. You can also find answers in our support section, live chat us or send us an email by clicking here.